Some ships already carry automatic identification systems (AIS) — devices that transmit publicly available data about the vessel’s identity, position, and course. But commercial fishing vessels are exempt in many jurisdictions. A group of researchers argues that new policies, including mandating that commercial fishing vessels carry AIS devices, are needed to curb illegal fishing, especially over vast stretches of ocean. Making vessels trackable will also help prevent collisions with whales and enable officials to monitor undersea mining, among other benefits, the researchers argue. Governments have been establishing enormous marine protected areas (MPAs) spanning hundreds of thousands of square kilometers where fishing is restricted. And the United Nations last June began work developing an international treaty to manage biodiversity on the high seas, the vast stretches of ocean subject to no nation’s law. But how will we enforce paper protections over areas far too big and remote to patrol by boat or plane? Make vessels, especially fishing vessels, trackable by satellite and the resulting data publicly available, says a group of researchers writing today in the journal Science. Then law enforcement will be able to see in real time which vessels are in a given area and intercept any that appear to be involved in illegal fishing or other activities. Each year, illegal fishers are estimated to net up to 26 million tons of seafood worth up to $23.5 billion annually, according to a 2009 study. Illegal fishing undermines conservation efforts and is associated with slave labor and human trafficking. The world’s oceangoing vessels are already part way there. Many carry automatic identification systems (AIS) — devices that transmit data about the vessel’s identity, position, and course that is intended to prevent collisions. Until recently transmission occurred via VHF radio, but recently satellites have begun picking up the job, transmitting mass AIS data to anyone interested in reviewing it, anywhere on the globe. 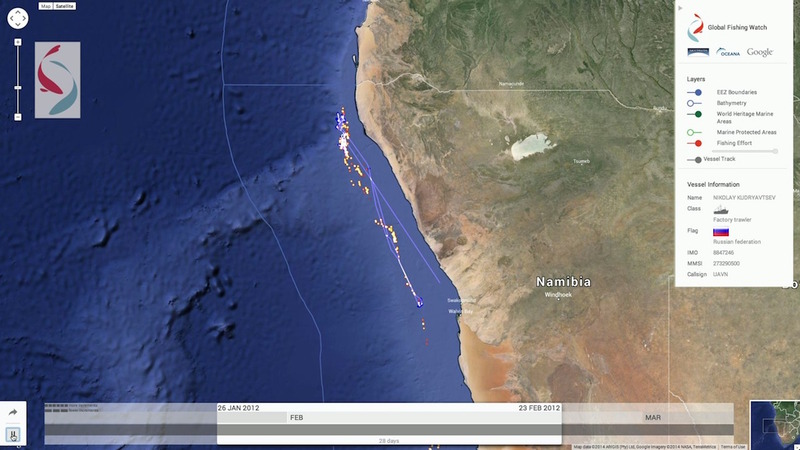 Image based on satellite data shows the track of a Russian trawler off Namibia. 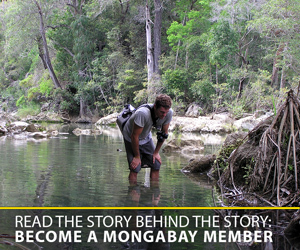 Image courtesy of SkyTruth and Global Fishing Watch. Groups like SkyTruth, a West Virginia-based nonprofit, are already analyzing this data to assist law enforcement officials in apprehending illegal fishing vessels. The problem, according to Douglas McCauley, lead author of the Science paper, is that fishing vessels often don’t carry AIS devices, and that requirements to do so vary from place to place. “The International Maritime Organization has done a good job getting member states to require publicly accessible tracking of large cargo ships and passenger ships, but a poor job building coverage for fishing vessels,” McCauley, a marine ecologist at the University of California Santa Barbara, told Mongabay. “The EU is strict, Ecuador and Mauritius require all fishing vessels to do this, but US is fairly lax and Canada doesn’t require any fishing vessels to comply,” he added. To prove their point that satellite AIS data can help monitor vast stretches of sea, McCauley and his coauthors, including SkyTruth’s chief technology officer Paul Woods, took a look at the data from purse seine fishing vessels on 26 million square kilometers of high seas in the tropical Pacific. The data showed “hot spots of purse seine activity” around Ecuador’s Galapagos Marine Reserve and Kiribati’s Phoenix Island Protected Area. They also zoomed in on the Kiribati protected area, which is about the size of California, and examined AIS data showing ship traffic there before and after the area was closed to fishing on January 1, 2015. Happily, the MPA appeared to be working well. The data showed plenty of fishing activity before the closure that dropped off sharply after. Of course, it’s possible vessels were fishing illegally in the reserve that had turned their AIS transponders off, a common practice among fishers that don’t wish to be tracked. Other tricks include falsifying positional data and transmitting inaccurate identification information, according to the paper. “Unfortunately, current lack of legislative support for AIS has stunted this system into a service that best observes vessels that don’t mind being seen,” the authors write. Several analytical techniques are now being used to outsmart the cheaters, and even more AIS-capable satellites are scheduled to come online soon, which will improve data access. But McCauley and his coauthors argue that three new policies are needed to transform AIS into the illegal-fishing-busting machine that it has the potential to be. First, they write, the International Maritime Organization and its 171 member countries must require all commercial fishing vessels longer than 15 meters and all large vessels to carry “publicly accessible, tamper-resistant” AIS devices. Second, vessels carrying these AIS devices must be required to obtain and maintain unique identification numbers. And third, countries must enforce vessels’ proper use of their AIS devices. The rewards of such a system wouldn’t be limited to busting fishing scofflaws, according to the paper’s authors. “If we got to a future where all types of vessels used AIS responsibly the intelligence of ocean management would jump up by 100 IQ points. We could reduce whale ship collisions; zone the oceans to find optima that maximized biodiversity yields, fishery profits, shipping efficiency; track real-time the beginnings of seabed mining…a long list,” McCauley writes in a press sheet sent to journalists. • McCauley, D.J. et al. (2016). Ending hide and seek at sea. Science 351(6278): 1148-1150. • Agnew D.J., et al. (2009). Estimating the Worldwide Extent of Illegal Fishing. PLoS ONE 4(2): e4570.